DA Form 7120 - also known as the "Commander's Task List" - is a United States Military form issued by the Department of the Army. The form - often mistakenly referred to as the DD form 7120 - was last revised on April 1, 2016. Download an up-to-date fillable PDF version of the DA 7120 down below or look it up on the Army Publishing Directorate website. PRINCIPAL PURPOSE(S): To track Aircrew Members' Flight Records. DISCLOSURE: Voluntary. Disclosure of birth month is voluntary; however this form will not be processed without the Aircrew Member's birth month. 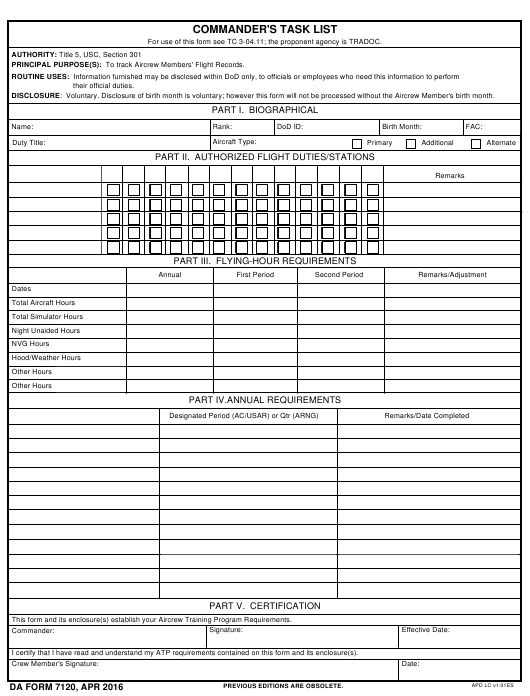 This form and its enclosure(s) establish your Aircrew Training Program Requirements. I certify that I have read and understand my ATP requirements contained on this form and its enclosure(s).